NOTE! DUE TO THE HIGH DEMAND OF HANDLEBAR & CABLE KITS IT COULD BE UP TO 5 BUSINESS DAYS BEFORE YOUR ORDER WILL SHIP. THANK YOU FOR YOUR PATIENCE. IF THE BURLY BRAND CABLE KITS ARE OUT OF STOCK THEN WILL SUBSTITUTE HIGHER QUALITY CABLES AT NO EXTRA CHARGE. Does your scooter have dual front brakes? 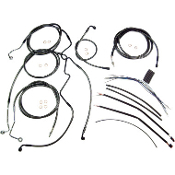 Contact us to see if a cable kit is available! Most of these cable kits are made by Burly Brand. NOTE: DUE TO HIGH DEMAND CAN TAKE UP TO 2 BUSINESS DAYS TO SHIP. SINGLE FRONT DISC ONLY! NOTE: DUE TO HIGH DEMAND CAN TAKE A COUPLE BUSINESS DAYS TO SHIP. NOTE: DUE TO HIGH DEMAND CAN TAKE UP TO 2 BUSINESS DAYS TO SHIP. NON-ABS MODELS ONLY! 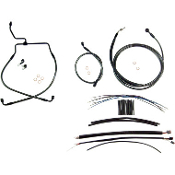 Handlebar & Cable kits for 1996 and newer models. PLEASE NOTE: DUE TO HIGH DEMAND CAN TAKE UP TO 2 BUSINESS DAYS TO SHIP.